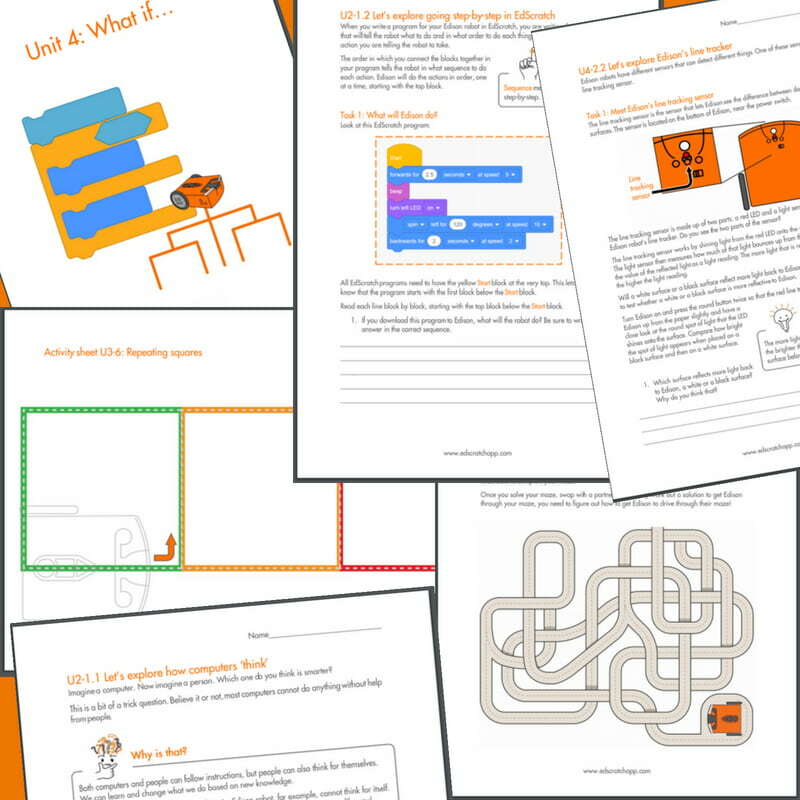 To help you get the most out of EdScratch, we’ve also created a series of free video tutorials organised around the units in our free EdScratch lesson plans. Each tutorial video in the series examines new elements in the EdScratch environment and the related computer science concepts from the lessons. Be sure to check out the whole series! These free, downloadable resources can help you get the most out of EdScratch. 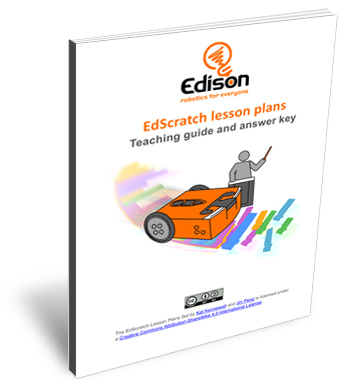 Consisting of the Student Set and accompanying Teacher’s Guide, The EdScratch Lesson Plans Set includes a complete curriculum for teaching computational thinking and computer science using EdScratch and the Edison robot. The lesson activities and project ideas are organised into six units beginning with an initial preparatory unit and culminating in an open-ended project-based unit. Designed for flexible use, you can choose just the activities that suit your interests or teach the entire curriculum! The student set of the EdScratch lesson activities contains worksheets and activity sheets designed for independent use by students in Year 5 (10-11 years old) and above. With 98 activity options organised into six units, the student set contains a mix of structured and open-ended activities that introduce key concepts and learning objectives while engaging students in an active exploration of Edison and EdScratch. The student lessons include clear instructions, colourful illustrations, activity sheets for testing program solutions and challenges for students to work through as they learn computational thinking and computer science fundamentals. an answer key including recommendations on assessing student work. The EdScratch programming environment includes a ‘bug box’ at the bottom of the app which automatically checks for errors in the program. Warning messages are displayed in this bug box to help you find and fix problems in your code. This guide includes all the warning messages that can be displayed in the bug box of the EdScratch language app, including an explanation of what each means and examples of when you may encounter the message. Give your students opportunities to program solutions to real-world robotic challenges using EdScratch and EdCreate, the Edison robot creator’s kit. Multiple programming challenges using the EdCreate EdBuilds are available in the EdCreate teaching guide. Or unlock your student’s creativity and EdScratch programming prowess with the EdCreate EdChallenges! How do I access EdScratch? How do I run an EdScratch program on Edison? The Edison robot will then carry out the program’s commands in sequential order, moving through the code step-by-step. Where do I find all the blocks I can use? All of the EdScratch blocks are in the block pallet, which is located on the left-hand side of the EdScratch programming environment. Select a category from the nine options at the top of the block pallet to see all the blocks inside that category. The written description on each EdScratch block describes the command that block gives to the program. For any blocks which have input parameters, (including number inputs, drop-down menu options and greyed-out holes) you can change the input parameters to modify the command. You can learn more about the different EdScratch blocks in our tutorial videos which walk through each type of block in line with the EdScratch lesson plans. What are the greyed-out holes in some of the blocks? Some EdScratch blocks contain an oval or a diamond-shaped hole which is greyed-out in the base block. These holes are spots for special input parameters which can be added to the block using appropriate diamond or oval-shaped input blocks. Helpful warning messages related to these blocks will appear in the bug box at the bottom of the EdScratch programming environment. These messages provide details specific to the blocks in your program. You can learn more about these types of input parameters in our tutorial videos which walk through each type of input parameter in line with the EdScratch lesson plans. What are the yellow and red messages in EdScratch? The EdScratch programming environment includes a ‘bug box’ at the bottom of the app which automatically checks for errors in the program. Warning messages are displayed in this bug box to help you find and fix problems in your code. There are both red and yellow warning messages which can appear depending on the issue detected. You can learn more about the error messages in EdScratch in our tutorial videos and in the EdScratch warning messages guide. How do I save my EdScratch program? To save your programs in EdScratch, you need to have an account and be logged in. You can create an account by clicking on the menu button in the upper left-hand corner of the app. Select the ‘Register’ option and follow the steps to register your free account. Once you are logged in as a registered user, you can save your program by clicking on the ‘Save’ button next to the menu the upper left-hand corner of the app or by opening the menu and selecting the ‘Save As’ option. How do I update my account details and password in EdScratch? You can update your account details, including your password, by clicking on the menu button in the upper left-hand corner of the app and selecting ‘Settings’ from the menu while logged in. If you have forgotten your password, select ‘Login’ in the menu, then select ‘Forgot Password?’ and follow the steps to reset your password. Blocks can be deleted by dragging them to the bin in the lower right-hand corner of the EdScratch app, dragging the blocks back to the block pallet, or by right clicking the block with your mouse and choosing the ‘Delete Block’ option. How do I copy blocks? You can add additional copies of blocks to the programming space by dragging the blocks you want from the block pallet to the programming area. You can also right click the block with your mouse and choose the ‘Duplicate’ option. Blocks in the ‘Events’ category of the block pallet cannot be duplicated. A maximum of one of each Event category blocks can be in a program. You can learn more about the Event category blocks in our tutorial videos and the EdScratch lesson plans. Where are the blocks in the ‘Data’ category? The Data category allows you to make and manage variables for use in your EdScratch programs. To use variables in EdScratch, click on the Data category in the block pallet, then click on the ‘Make a variable’ button. Once you enter a name for your variable, click the ‘Create Variable’ button. This will generate your variable and populate the Data category with a set of blocks you can use with any variables in your program. You can learn more about the Data category and variables in the Unit 5 video of our tutorial videos and in the same unit inside the EdScratch lesson plans. What characters can I use in my variable names in EdScratch? EdScratch variable names can only contain lowercase English letters, uppercase English letters, numbers, and underscores ( _ ). Other symbols, like exclamation marks ( ! ) or spaces, are not allowed. Variable names cannot start with a number. What kind of language is EdScratch? 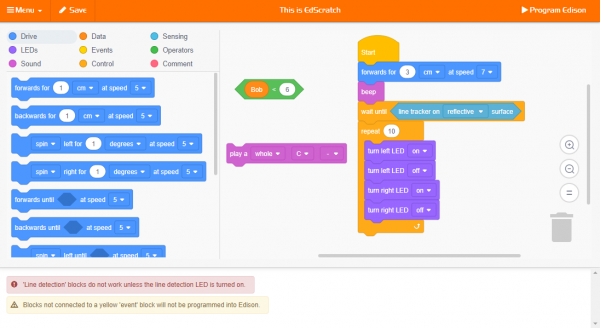 EdScratch is a vertical drag-and-drop block-based system that has been developed using the Scratch Blocks code base developed by the MIT Media Lab from the Blockly code base developed by Google. What age user is EdScratch for? EdScratch combines the ease of drag-and-drop programming with powerful functionality and flexibility, making it an ideal language for learning the foundations of computer science. EdScratch and the free-to-download EdScratch lessons are ideal for students in Year 5 (10-11 years old) and above. What do the different categories of blocks in EdScratch do? All of the blocks in EdScratch are arranged into one of the nine different block categories in the block pallet. The dark blue blocks in the Drive category are all related to the Edison robot’s motor outputs. The dark purple blocks in the LEDs category are all related to the Edison robot’s LED outputs. Both the visible light (red LEDs) and infrared LEDs outputs (for IR messaging) can be controlled using blocks in this category. The light purple blocks in the Sound category are all related to the Edison robot’s audio outputs. Single beeps, musical notes and blocks which control only music note blocks are all in this category. Initially containing only two buttons, the Data category is how you make and manage variables in EdScratch. Once a variable has been created by using the ‘Make a variable’ button and giving the variable a name, the Data category is populated with dark orange blocks related to data manipulation using any created variables. The yellow blocks in the Event category are all sensor-related event blocks that can be used as interrupts beginning subroutines in EdScratch programs. 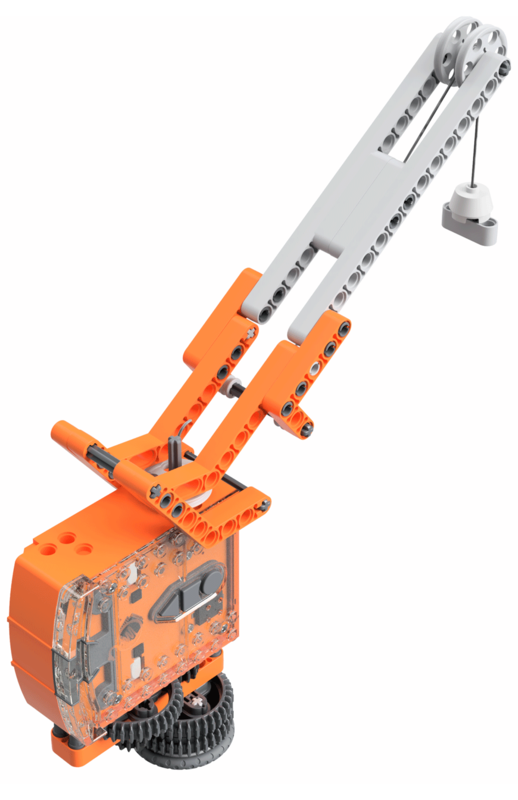 The light orange blocks in the Control category are all programming control structures which can be used to affect the flow of an EdScratch program. Loops, waits and if-statement control blocks can all be found in the Control category. The light blue blocks in the Sensing category are all related to the Edison robot’s various sensors. These blocks allow you to turn different sensors on or off, clear stored sensing data and use sensing data as value inputs (oval shaped blocks) or Boolean inputs (diamond-shaped blocks) inside blocks in an EdScratch program. The green blocks in the Operators category are all blocks that can be used as either value inputs (oval shaped blocks) or Boolean inputs (diamond-shaped blocks) inside blocks in an EdScratch program. The Operators category blocks include expressions and computation operators designed to be used with sensing and other data inside programs. The pink block in the Comment category allows you to add in text comments as notes in a program. Comment blocks are ignored by the compiler and have no affect on the EdScratch program. Comments are designed to be used as useful ‘sticky-notes’ helping the programmer and others understand the program. Which browsers are compatible with EdScratch? EdScratch is compatible with Chrome, Safari, Microsoft Edge and Firefox. To ensure optimal performance, it is strongly recommended that you use EdScratch with Chrome. Is there an EdScratch iOS/Android app? You can use EdScratch through the online app at https://www.edscratchapp.com/ with devices running either iOS or Android. Dedicated iOS and Android apps for EdScratch are being considered but are not currently in development. Please be sure to sign up to our newsletter to be informed about future app releases. Is there an offline version of EdScratch? At this time, there is no offline or downloadable version of EdScratch in development. As such, you do require an internet connection to use EdScratch. Can I switch the display language in EdScratch to something other than English? At this time, EdScratch is only able to display English inside the application. We will be looking into a translation solution for EdScratch in the future, but do not have a release date for this feature at this time. Please be sure to sign up to our newsletter to hear about this update when it becomes available. If you have a red warning message in the ‘bug box’ at the bottom of the EdScratch app, you will not be able to download the program until this critical issue is resolved. You can learn more about the error messages in EdScratch in our tutorial videos and in the EdScratch warning messages guide. How do I use EdScratch with Version 1 Edison robots? 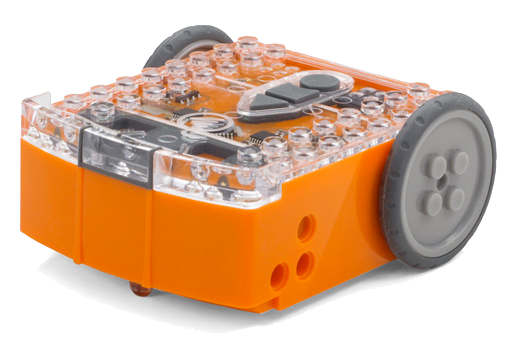 Version 1 Edison robots which have the latest firmware update are compatible with the EdScratch programming app with a few limitations. Version 1 robots are only capable of using time to measure distance, and therefore users must select ‘seconds’ as the distance units option in any block that requires this input parameter. Selecting other distance units input parameters, such as ‘cm’, ‘inch’, or ‘degrees’ will not work with the Version 1 robots and can result in some bizarre behaviour from the robot. Likewise, it is recommended that you avoid using the sensing and event blocks related to ‘drive strain’ with Version 1 robots as these blocks can cause the robots to behave erratically. How do I fix warning messages in the bug box? If there are any red warning messages, you will not be able to download your program until you resolve the issue as explained in the warning message description. When a yellow message is displayed, the program can be downloaded to the Edison robot, but may or may not work as expected. If a program is downloading but not working as expected, check the bug box for any yellow messages which can help you resolve logical errors in a program. Why aren’t there any blocks in the ‘Data’ category? When you first open the Data category in the block pallet in EdScratch, the category initially containing only two buttons. You need to create a variable using the ‘Make a variable’ button, then give the variable a name and click the ‘Create Variable’ button. This will create a variable and the Data category will be populated with that variable and a set of dark orange coloured blocks related to data manipulation using any created variables. Why isn’t my program with variables downloading to Edison? Only variable names using legal characters will be able to be compiled and sent to Edison. If you get any error messages when trying to download a program with variables, or if a program with variables in it is failing to download, check the names of all variables to ensure they are using only lowercase English letters, uppercase English letters, numbers, and underscores ( _ ). Translation kits, translated versions and more. Looking for just one unit from the EdScratch lesson activities? Each of the six units is available as an individual PDF set, free to download. The EdScratch Lesson Plans Set by Kat Kennewell and Jin Peng is licensed under a Creative Commons Attribution-ShareAlike 4.0 International License. Looking to translate the EdScratch resources into another language? Download the translation kit to get the editable files you will need.